One album to rule them all? Creating a full-on “cinematic metal” album is an ambition Luca Turilli hasn’t exactly kept secret throughout his illustrious career but it sure has taken him a damn long time to follow through on it. “Symphonic Epic Hollywood Metal” may admittedly sound silly and while we all just grimaced and pinched his cheeks as he had his fun with Staropoli and company, the time has finally come to sit stiffen our postures and take the man seriously. With all these years of boasting, then, we should rightly expect the new album, Prometheus, Symphonia Ignis Divinus, to blow us away in that idiosyncratic area of self-specialization, yet for all its intentional bombast and over-orchestration there is surprisingly very little to keep one engaged once the dust has settled. Through the fire and flames Turilli has indeed managed to ignite all his creative sparks into scorching explosions of sound that even Michael Bay would envy, a culmination that “Rosenkreuz (The Rose and the Cross),” shows off well, if a bit too unevenly in its emphasis. Adding to such an overtly film-score narrative would be the peripheral role of the guitars, which is not only obvious through the mixing but also in structural presence, including a noticeable paucity of solos. Moreover, Alessandro Conti’s dual roles as power metal and opera singer are more dichotomized this time around, his talent at blending the two styles marginalized, which makes his presence much less distinctive. In this sense, Turilli could’ve picked two different singers for the jobs rather than drown Conti in layers upon layers of vocal arrangements that do more to highlight Turilli’s ambition than his recognition of the other talent he has in the band. 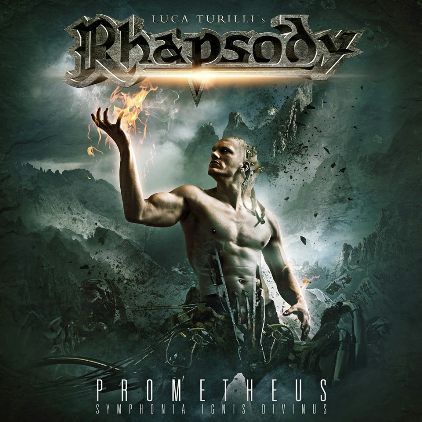 Despite such insistent sidelining, Prometheus still manages to be very impressive, due mostly to its unwavering consistency in larger-than-life choruses that all together make the album one of Turilli’s most listenable works in its entirety. Ironic, really, when one considers that a vision intended to be so epic can be stripped down to such barebones appeal and resonate accordingly, perhaps the lopsided compromise between cinematic ambition and power metal. The album does a decent job, too, at relieving one from its bluster with the traditionally and comparatively more classically oriented “Il cigno nero,” “Il Tempo Degli Dei,” and “Yggdrasil,” all of which constitute a spread out triptych of memorable moments. Such victory laps around memory lane are indeed what the album needs, for without these tracks, “King Solomon and the 72 Names of God” could, by virtue of track order, grow very heavy on beleaguered ears, and the album as a result would seem exceedingly off kilter. The album’s strengths are indeed strong enough to tolerate the considerable heft of its weaknesses, which is a triumph in its own right, but with such over-arching linearity comes a lack of standout, clearly distinctive tracks, aside from the ones highlighted above, which are quite tame by contrast. The result is an overall soundscape that in its enormity is very remarkable for the first few listens but wears out its welcome even after moderate familiarity. This lack of staying power is a regrettable loss of character for Turilli, who seems to be forgetting some of the finer details that made the previous album such an exhilarating ride, and indeed, much of his earlier work, including his solo career. This entry was posted in Featured Review, Reviews and tagged featured, Luca Turilli, Luca Turilli's Rhapsody, Nuclear Blast Records, Pathfinder, power metal, rhapsody, Rhapsody Of Fire, Symphonic Power Metal, Symphonity. Guitars absolutely buried in the mix, weak "orchestral" arrangements that sound like they were written and performed on a Casio keyboard from 1989, disjointed choirs and monotone lead vocals. I actually hated this album, and I am (was?) a big Luca Turilli fan. The terrible mixing was my first impression, too, and although you get used to it, all the other "flaws" just seem to follow naturally, such as the over-reliance on blustering orchestrations and dumbed down structuring. I still consider myself a huge fan of Luca Turilli and despite all my bitching the album is still very good!